Enough complaining. I just finished a book I just loved, beginning to end, top to bottom. It's Cranford (1852-3). I was surprised to find, earlier this year, a certain amount of humor in some of Gaskell's short stories, carefully rationed. I now see that she was saving all of the funny bits to put in Cranford. There's the butter, obviously. The butter passage is preceded by the string and rubber band section, and followed by the candle section. "As we lived in constant preparation for a friend who might come in any evening (but who never did), it required some contrivance to keep our two candles of the same length, ready to be lighted, and to look as if we burnt two always." 'Only a little drop--just necessary to make it keep," said Miss Barker. 'You know we put brandy-paper over our preserves to make them keep. I often feel tipsy myself from eating damson tart.'" To make it keep! Damson tart! I would have finished this book a lot sooner if it were not for passages like this, which I had to immediately re-read. I did not have to read them all to meine Frau, though, because after one or two she snatched the book from me and read it all herself. Which, come to think of it, slowed me down even more. How about the episode of the lace, and the cat, and the proper kind of story to tell a lady of quality. You would never guess where that lace has been. Isn't Elizabeth Gaskell a crusading social reformer, her novels weapons in the arsenal of the poor and beaten down? I haven't read any of those books, so I can't be sure, although I think the answer is yes. At the same time Gaskell was writing Cranford, she was also working on Ruth (1853). Let's take a look at the entry for Ruth in the Oxford Companion to English Literature. Let's see: "orphan," "rescued from suicide," "seduced and deserted," "cholera epidemic." Mm hmm. So Gaskell was writing, at the exact same time, one of the funniest novels of the century, and one of the grimmest. This week, it's all Cranford at Wuthering Expectations, always funny, never grim. Also, it turns out, not, in the end, so far from Gaskell the crusader. By the way, I've learned a thing or two about Gaskell from JaneGS at Reading, Writing, etc., a great champion of Gaskell. I just started reading Alessandro Manzoni's On the Historical Novel (1850), which includes many of the arguments I and others have made this week, couched in a subtle, ironic rhetoric. I think it's ironic - maybe he means exactly what he says. So far, Manzoni has used his essay to completely demolish the historical novel: "it is the historical novel itself that is completely at fault. "* Manzoni is himself the author of one of the best historical novels ever written, The Betrothed (1827), so perhaps I am misreading. Regardless, it's full of useful ideas. I may return to it soon. A Professional Reader might have thought to look into the subject before writing so much. Ah well. Anyway, my final complaint or concern or prejudice is more about books that come in series than about historical novels as such. The mystery series is the mode of our age, what people read. On trips to Germany, I have marvelled at the richness of the literary culture, about the attention received by serious books. But what do Germans really read, really, more than anything else? Mysteries that come in series. I'm using "mystery" generically, including thrillers and such - the Owen Parry novel I read claimed to be a "novel of historical suspense." Everything gets shoveled into mysteries now, including stories about the birth of Italian Futurism and stories about New York City midwives. When I described my pile of six mysteries, I didn't say anything about the plots, not because of concern about spoiling the surprise, but because the plots don't matter, not in any of them. The settings matter, a lot, and the choice of detail, and the voice. But the plot, the actual mystery in the mystery, is always just something pulled off the shelf of time-tested devices. Because the clever author (and every author I tried was clever enough) knows that we cannot just march from the beginning of the mystery to the end, the story has to be well-larded with incidental material that slows us down, with each episode of the novel giving us 1) one piece of genuine information, 2) several interesting but in the end deceptive pieces of information, and 3) directions to the next episode. There must be writers who can break free of this formula. But if they do so, are they still writing mysteries? So if I find myself wearied with the repetition found among six different authors, I can guess how I'd feel reading more books by the same author. Steve Hockensmith's cowboy Watson and Holmes are in four novels now. Besides the train, one's on a ranch in Montana, one's in San Francisco, one's in Texas. That's something. But they're really just the same dang thing over and over again, aren't they? I suspect that's true of more authors than Hockensmith. It's not what I'm looking for in fiction. With some time - a year, years - I'm likely to try one of these authors again, probably Parry or Hockensmith. The memory of the original pleasure will have dimmed, and I will be ready to enjoy the same dang thing. That formula works in one way - I turned every page of every book, faster and faster until I got to the end. * P. 72 of Alessandro Manzoni, On the Historical Novel, tr. by Sandra Bermann. University of Nebraska Press, 1984. ** Now if someone were to write or has written a pie sea story, I might just read it. 'Cause the idea is so stupid. On Tuesday, Margaret D, host of the remarkable HistoricalNovels.info site, asked a pertinent question: why even bother with a historical novel? Meaning, the historical aspect should have some sort of point. My pile of five novels do pretty well by that standard. It's the contemporary mystery that turned out to be pointless. Here's where I say nice things about Victoria Thompson and Murder on St. Mark's Place. I didn't like it that much, but I understood why she chose the story she did. In this novel, so-called "charity girls" are being beaten and killed. "Charity girls" are immigrant girls, factory workers, mostly, who pick up men at dance halls. They're not prostitutes, they insist, because they don't take money, just gifts. The detective is a New York midwife, now living in a working class area, but actually from an old, wealthy Dutch family. She is independent, tough, a typical literary "strong female character." The world of young women who go dancing every night and go to hotels, or worse, with strange men is completely unknown to her. She's an outsider who can fill the reader in on all of the shocking details. This is how we get out to Coney Island, by the way, to see that Elephant Hotel - that's a place where men take their dates. I thought this was all pretty interesting. The novel is not merely about violence against women, but also about the social changes of the past one hundred years. Some things have improved enormously for women in this situation - their incomes are dramatically different, for example. But the fear of violence, if not the risk, from men, strangers or otherwise, remains. So Thompson's then/now comparison has some power, a resonance that the mystery itself, standard genre business, lacked. The novel has plenty of problems, but it has a meaningful purpose. I'm pretty sure that Michael Pearce's A Dead Man in Trieste has a serious purpose as well. I just didn't understand the argument he was making. Something about the role of the individual in larger events, or the role of the artist in guiding history, or something like that. Avant garde art is a necessary but futile protest against the march toward war? So disappointing, because Trieste is such an interesting city, and it was fun to see the author play with Marinetti and Futurism. But I'm not sure that it amounted to anything more than play. The Carlo Lucarelli and Owen Parry novel both investigate the compromises necessary for justice. Few ideas are more common in mysteries now, but the question is a big one, and worth pursuing from different perspectives - the unjust world of fascist Italy, the righteous cause of the fight against slavery. Neither of those novels has an especially original purpose. Steve Hockensmith's On the Wrong Track has no purpose at all, besides good clean fun. Mostly clean - there are a few descriptions of gunshot wounds that are bizarrely gory, well out of character. Some misguided attempt at realism? A trivial book, I'm afraid, but not a disappointment. It is what it is. Of the five historical mysteries I read over my summer vacation, I liked three of them enough to consider reading more in the series. * The little Banville novel is something of an exception, since I've already read all but a few of Banville's books. I'll really lay into Banville tomorrow, so let's set that one aside. Maybe I'll set Carlo Lucarelli aside, too. The greatest interest there is thematic. Plus, it was so short, you read all three books in the series, and you're not even close to 300 pages. Easy reading. In two other novels, the great appeal of the writing is the voice of the narrator. Steve Hockensmith is playing with the Sherlock Holmes type of mystery, so the narrator has to be Dr. Watson. But in this case, Watson is a burly cowboy named Big Red. Holmes is his older, smaller, smarter brother, Old Red. Old Red is illiterate, so Big Red has to read him the latest Sherlock Holmes stories. Also, the signs on the bathroom doors. The comedy can be a bit broad. Funny, though. That's pretty good. If its not quite characteristic, that's because of all the dialogue and plot fuss, most of which was all right. The book has many short chapters, which unfortunately often end with irritating false climaxes - this is my main stylistic complaint. They do work, though - I always wanted to keep going. Hockensmith's narrator has a typical comic voice. Owen Parry created something more original for his Civil War mysteries. Abel Jones, our hero, is Welsh, a veteran of wars in India, a wounded veteran of Bull Run, and a Methodist teetotaler. He is earnest and self-righteous, full of prejudices (against the Irish, the rich, cavalrymen). And he's scared of horses, "great stupid things," "four-legged demons." The comedy of the book, which in many ways is a quite serious piece of work, comes from the narrator's inability to suppress his judgmental scolding, even while telling the story of a murder investigation, or a battle. Mostly, he's a driven man on a mission, but he continually pauses to zing his superiors, scold his inferiors, and praise his own virtue. An example of the latter: he does not drink, of course, but he'll buy whiskey for other people, in order to get them to spill secrets. But then he tells us that he feels bad about it. Maybe this isn't meant to be funny, but I think it is, because it works so well. It deepens the character - in some ways he's a very narrow man, while in other ways he's an abyss. It keeps me guessing, at least - just what will he be capable of, this strange fellow. My only real disappointment with the book is that the answer is: whatever is necessary to fulfill certain plot and genre expectations. But let that bide, as Captain Abel Jones always says when he suspects he's gone a bit too far. By the way, neither of these narrators, both of whom are supposedly writing their stories, sound remotely like they actually would have, telling their own stories at the time. But, fortunately, I don't care about accuracy. * In the right situation - trans-Atlantic flight, for example - I'd read more of any of them. I just wouldn't go out of my way for more Victoria Thompson or Michael Pearce. ** The Parry and Hockensmith books are both quite funny, but my only audible laugh came from the Michael Pearce novel, the one set in Trieste. The angry, drunken Irishman, suspected of murder, turns out to be James Joyce, which is funny enough. Wait, I thought, Italo Svevo lived in Trieste, too - I wonder if Pearce can work him in. About two pages later, there he was, under his real name, smoking one of his last cigarettes (see The Confessions of Zeno, Ch. 1). That's where I laughed. A couple of the historical mystery authors I just read - specifically, Victoria Thompson of gaslight New York and "Owen Parry" of Civil War Washington, D.C. - express, in afterwords, pride in the accuracy of the details in their books, despite the fact that Pride is a mortal sin. They want to be sure to tell us which few, tiny details in their novels diverge from historical fact. Coney Island's Elephant Hotel, for example, was abandoned by 1896, and burned down the same year, but Thompson thinks it's neato and keeps it in business in her book. Otherwise, though, everything is totally accurate, "t"s crossed, "i"s dotted. Uh huh. Much of what I write this week will be a confession of prejudices, I fear, evidence, perhaps, that I have no business reading these books (although I enjoyed them all, more or less). Still, as to the accuracy of the historical mystery, of any novel: I don't care, I just don't care. Great writers create worlds that are nearly complete in themselves, lacking nothing but the imagination of the sympathetic reader. They borrow from the actual world around them, but in the end it's most important that the fictional world is true, not that it intersects with the real world in arbitrary or trivial ways. Because, I gotta say, there's plenty about every one of these novels that is untrue, regardless of how particular dates and events mesh. And, at their best, the novels contain other truths that have little to do with their historical accuracy - let's save that for later in the week. I liked the approach Steve Hockensmith took to his "cowboy detectives on a train" story. In his acknowledgments, he thanks seven railroad buffs and one gun expert. His research is not meticulous - he just asked someone what he needed to do to keep the sticklers happy. The topography of the train is actually incorporated into the plot, but even that doesn't really matter - different order of train cars, slightly different plot. The world he created is small, but has its own sense, and works fine. Some authors research their subject as part of their creative method. I'm thinking of Penelope Fitzgerald, novels like The Blue Flower or The Gate of Angels, which seem effortless, but are backed by intense archival work, hours digging around in old newspapers and diaries. The key here is that Fitzgerald used what she learned to inhabit her imaginary world, to make the fiction real. Almost all of the information she acquired in the process is omitted from the book. Among these mysterical histories, only Carlo Lucarelli, writing about World War II Italy, came close to achieving this effect, carefully failing to explain the importance of every political detail or branch of the secret police. Some of the details are even obscure, or confusing. Good. He trusts his reader, or perhaps just assumes that they're Italians who know what he's talking about. Every other writer from time to time hits the narrative brakes for an information dump. Hockensmith and Parry came off best, I think because of their first person narrators - they have to stay in character. A few passages in the Victoria Thompson and Michael Pearce novels, though, are little more than encyclopedia entries, on the history of Coney Island, or the politics of Herzogovina, or some other bit of curious lore. Thompson actually writes, about her policeman character, "He'd done some research on Coney Island and learned..." (p. 61), and then we get a page of Thompson's notes. When I said Thompson was clumsy, I meant passages like this. The same problem plagues historical novels of any stripe, not just mysteries. Walter Scott's novels often include detailed notes about the accuracy and sources of his various characters and events. I've read six Scott novels; in saying that I am definitely not including every word in every one of those notes. I remember the notes in Ivanhoe as being especially dull. Better historical novels - The Scarlet Letter, or Alessandro Manzoni's The Betrothed - excise everything that is merely factual. But, but, but, given that a novel or novelist may not be capable of creating an original world, historical or otherwise, given that the author is not Nathaniel Hawthorne or Penelope Fitzgerald, perhaps accuracy isn't such a bad goal. If a novel's mystery plot is typical for its genre (in every novel I'm considering, it is), the characters brightly colored cardboard, and the themes well-worn if we're lucky, we can at least enjoy some strange and wondrous details extracted from the library by our all too fatigable mystery writer. Because Victoria Thompson was right - it is neato that there was a hotel on Coney Island shaped like a giant elephant. I had no idea. By all means, use that in a novel. I'm happy to know about it. What I Read on My Summer Vacation. Mysteries, all mysteries, all new authors to me. Maybe you'll see a pattern. Owen Parry, Faded Coat of Blue (1999), 337 pp. A Civil War mystery by columnist and all-around military expert Ralph Peters. Series: #1 of 6, I think. Narrator: 1st person, with an original voice. Cameos: Abraham Lincoln, General George McClellan, Allan Pinkerton. Carlo Lucarelli, Carte Blanche (1990), 94 pp. A murder investigation set in 1943 Bologna. The Gestapo lurks everywhere; the Americans are coming. My understanding is that this author is hugely popular in Italy now. Series: #1 of 3. Narrator: 3rd person, plain, all business. Steve Hockensmith, On the Wrong Track (2007), 290 pp. A comic mystery, with two cowboys on a train between Utah and San Francisco in 1893. One of them wants to be Sherlock Holmes. The series is called Holmes on the Range! Har har. Series: #2 of 4. Narrator: 1st person - Watson narrates, of course, not Holmes. R. T. reviews the first novel in the series over here. Michael Pearce, A Dead Man in Trieste (2004), 188 pp. A British policeman in 1906 Trieste. Series: #1 of 6, maybe. Narrator: 3rd person, understated, repetitive. Cameos: Franz Lehar, Marinetti - the climax of the novel occurs during the first Futurist Evening. James Joyce! Italo Svevo! Victoria Thompson, Murder on St. Mark's Place (2000), 277 pp. A midwife solves murders in 1896 New York City. The second-worst novel I've read, for quite a long time. * Series: #2 of 11. Narrator: Third person, sometimes quite clumsy, although fortunately not always. Cameo: New York Police Commissioner Teddy Roosevelt, offstage. John Banville, The Lemur (2008), 134 pp. A typical Banville narrator becomes tangled in, and then somehow solves, a murder. This one is the worst book I've read in a long time. Series: Stand-alone, thankfully. Narrator: It's Banville, and not about the history of science, so it must be first person. Cameo: John Huston. I included page lengths because every one of them is too long, except possibly the tiny Lucarelli novel. This is my raw material for the week, as I try to figure out how these books function, what worked well and what didn't, and why anyone bothers writing or reading them. I don't read too many mysteries, so I'm likely to showcase some first-rate ignorance as the week progresses. My thoughtful readers can help me out. * Sounds sorta harsh. I'm going to say some nicer things about the book later. 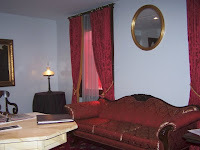 And, to the author (http://victoriathompson.homestead.com/), if you stop by, please look around the site. You will see that I am comparing you to Flaubert and Chekhov and the like. Jane Austen in Boca (2002) by Paula Marantz Cohen is the only novel I've ever read featuring a blurb by Joan Rivers. Cohen is an English Professor who has now written three novels, all quite funny, all romances wrapped around plots borrowed from elsewhere. I wrote a bit about the other two, Much Ado About Jesse Kaplan, and Jane Austen in Scarsdale, or Love, Death, and the SATs, back here. This one is Pride and Prejudice set in a Boca Raton retirement community. Is it necessary to say "Jewish retirement community"? I didn't think so. It's Boca Raton, FL, for Pete's sake. So Elizabeth Bennet becomes Flo, a widow, a former University of Chicago librarian. Sweeter, prettier sister Jane becomes May, Flo's sweeter, prettier friend. Darcy is a curmudgeonly retired English professor at Florida Atlantic University, who falls for Elizabeth, sorry, Flo, because she's interesting. Other correspondences are created, modified, or discarded as needed. Great fun, and mostly just an excuse to put a plot around a gentle, humorous novel about life in a Florida retirement community. "Once you get used to the Old English, it reads very fast." "I didn't know they were sarcastic back then, but I guess being sarcastic isn't necessarily modern." "I had four sisters, too. My mother didn't stop shvitzing until we were all married. I feel for that Mrs. Bennet." Jane Austen in Boca is definitely in the chick lit genre, retiree subcategory. I maintain - prove me wrong! - that it's the only chick lit novel that features a cameo by Saul Bellow. * Now I've read all three of Paula Marantz Cohen's novels, still the only examples of chick lit I've read. One might think that I was slumming in my vacation reading. I was, but not with this clever, light novel. Next week, the slumming. * Since Flo / Elizabeth was a librarian at the University of Chicago. That reminds me, I should tell my Saul Bellow story. So one time, around 1994 or 1995, I stood behind Bellow in the checkout line at the Regenstein library. I didn't realize it was him until he turned to leave, so I didn't see what books he had. Yeah, that's the whole story. Not quite a year after the Big Balzac Blowout, I have returned to Balzac, to The Wrong Side of Paris (L'Envers de l'histoire contemporaine), a short novel about a young materialist who is drawn to what amounts to a charitable Catholic secret society. In part I (1845), he learns about the society; in Part II (1848), he is assigned to his first case, which turns out to be tied in with the society's history. The youngster presumably finds a spiritual purpose. The novel is sincere, genuinely Catholic. The translator of this 2003 Modern Library version, Jordan Stump, writes that he pulled the novel from the Balzac slush pile, the dozens of Balzac stories that have not been translated since the era, circa 1900, of the "Complete Balzac" sets that can still sometimes be found in libraries. The Wrong Side of Paris is by no means first-rate Balzac, but it does something that I don't think I previously detected in Balzac. The author intended this work to be the final piece of the Human Comedy, and it really does work that way. I mean something different than the use of recurring characters, or the creation of Balzac's personal Paris that can be found throughout his work. The novel has some of that, certainly, but it is not a reunion of Balzac characters. It is a reunion of Balzac themes. Hints and glimpses of earlier Balzac novels permeate this one. Sometimes the references are direct. Much of the backstory, for example, is drawn from The Chouans (1829), the first novel Balzac published under his own name. More often, though, I found a similarity of character, or situation, or theme. The protagonist is a weak version of the heroes of Père Goriot and Lost Illusions. The leader of the secret charity resembles an older Eugénie Grandet. Hints of The Country Doctor or The Atheist's Mass appear. I've probably missed many more correspondences. The story adds up to a sort of apotheosis of Balzac's idea of a virtuous life, with his cynics and sensualists and schemers in exile. The Wrong Side of Paris is obviously not the place to start reading Balzac. My post of suggestions does not need amendation. As a somewhat more advanced Balzackian, though, it was worth my time. And it brings my Balzac Human Comedy reading tally to 31 of 91. At this rate of one more per year, I'll just need - uh oh. Maybe I'll have to pick up the pace a bit. Wuthering Expectations is back from its peripatetic, baby-centric American vacation. Babies have little to do with 19th century literature, unfortunately. 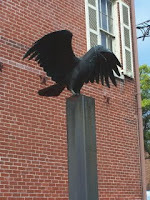 I did make one stop, though, that I am compelled to mention here, at the Edgar Allan Poe National Historic Site in Philadelphia. The site, a few blocks north of the core of 18th century buildings around Independence Hall, is in a plain house of the 1820s, the only survivor of several houses Poe and his wife (and mother-in-law) inhabited in Philadelphia. 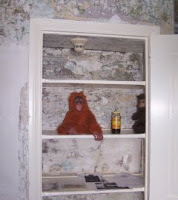 The house itself is nothing too special,* aside from the orangutans in the closet, presumably a prop for the guided tour. Don't miss the "Black Cat" basement. The materials - the short film, the photos and testimonials, the interactive displays - do their best with a difficult job. An impossible job. How many ways are there to experience Poe, really? One can read his work, or listen to someone else read it. Everything else is peripheral. 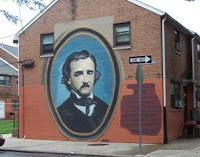 The Poe site has to find some way to include the visitor with only the vaguest sense of who Poe was along with enthusiastic amateurs and real experts, the person who knows "The Raven" from The Simpsons and the American literature professor and me. Hopeless. Still, it's a struggle worth some effort, and I have no suggestions for improvements. I learned a few new things and enjoyed immersing myself in Poe's real world (meaning family life, changing houses, badly paying publishers, and so on) for a bit. And it could be worse. Heaven knows what goes on at the Eugene O'Neill National Historic Site in Danville, California. Visitors staggering about in sleveless tee-shirts yelling "Stella! Stella! ", polite park rangers calmly suggesting that they might be thinking of someone else. One room was a surprise. Earlier this year I wrote about Poe's story or sketch or curiosity "The Philosophy of Furniture" (1840/1845), the climax of which is a detailed description of the ideal room, including every painting, decoration, and stick of furniture, down to Poe's friend asleep on the sofa. The reading room, left, reproduces that room. I mean, to the limited extent possible. The original is much larger, and oval, and as you can see the sofa is unoccupied. Readers of Roberto Bolaño will remember that one of the writers in Nazi Literature in the Americas also reproduces the room, and that Bolaño simply plagiarizes Poe in his description. So it was great fun to see an attempt at the same thing. Ridiculous, hilarious, inspired. Too bad they couldn't really do up the whole thing. My photo gives no sense of how beautifully crimson the room is, just like the story specifies. Poe Calendar Rob used to work here. Rob, I mentioned to the two genial, informative rangers that I read your blog. They said nice things about you. The link, by the way, goes to a nice bit of enthusiasm that Rob mischaracterizes as "gushy." No, spot on. 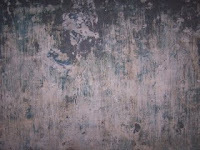 * The rooms are unfurnished, the walls stripped. As a result, wandering through the empty rooms, one is presented with fantastic abstract masterpieces that could serve as illustrations to Eureka. On a brilliant day, I came to view the mountain. Trapped wrongside up and steeped in the clear water. Looked up and gaped with relief that they had not fallen in. Boy oh boy am I glad I did not start my reading of Chinese poetry with this book, Poems of the Late T'ang (1965), translated by A. C. Graham. Unlike David Hinton or Kenneth Rexroth, this earlier editor is attracted to the most difficult, allusive, or plain weird poems. It's good to see some different sides of this complex subject, but Graham would have scared me right back to Europe. Still, I sure like those confused, happy monkeys. Still, also, on vacation. mountain peaks breaching low clouds. In grasses, everywhere, rainfall glistens. aching across such distances, distances. Meng Hao-Jan (689-740), from The Mountain Poems of Meng Hao-jan, tr. David Hinton, a very attractive book. I'm still wandering about. Skies open out, late light aslant. Wuthering Expectations will be on vacation until, oh, I don't know, August 18th. Or 19th. It's summer, and I've thrown caution to the very winds. We will be wandering about the United States, visiting babies, and perhaps other people. I suppose a computer will be available now and then, I can still respond to comments, correct errors, suggest recipes, and so on. If a Chinese poem or two suddenly shows up, that means I scheduled something in advance. My great regret about going on vacation now is that it curtails my participation in the Villette discussion at The Valve. I regret this because I will be unable to propound my new crackpot theory, that the novel has not one but two imaginary authors, that it's collaborative. Lucy Snowe puts pen to paper, but parts of the novel are dictated to her by someone else. Now I need to reread the book and decide which author is responsible for which part. See Chapter 33; search for "dictation." This theory requires a certain spin on the novel's ending. And its beginning. Also, the parts in the middle. But it is consistent with the crackpot theory that the main characters are secretly Jewish, so that's a plus. Villette lends itself to this nonsense. Here's how Lucy describes her own approach to art, in Chapter 19: "Meantime, I was happy; happy, not always in admiring, but in examining, questioning, and forming conclusions." Have a nice summer. Read some good books.